Before their story became the basis for a massively selling memoir, a Tony-nominated play and a movie, the Delaney sisters weren't widely known. That suddenly changed when at the respective ages of 103 and 101, Sadie and Bessie sat down with a reporter from The New York Times to talk about their lives. Born to a former slave who became the first African-American Episcopal bishop, the Delany sisters went on to be pioneers in the fight for civil rights, witnessing a century of change from the front lines. Now, Chicago's Goodman Theatre brings the "provocative and entertaining" (The New York Times) stage adaptation of their journey to life. "...At its core, this is a nonfiction work of biography - ideal, by the way, for young people who may not know all or any of this history - about lives of quiet revolution, or quotidian determination. You see the grief that comes to many of us later in life when we lose our parents. You realize that without love we're all not much more than a hill of beans." "...Guided by Chuck Smith's deft direction, Ella Joyce (Bessie) and Marie Thomas (Sadie) winningly bring the sisters to life with warmth, grace and good humor. During this two-hour immersion, one can't help but be swept up in this compelling look at history through the memories of these two resilient women." "..."Having Our Say" is told entirely from the perspective of the two unmarried Delaney sisters Bessie (1891-1995) and Sadie (1889-1999). Though the notion of listening to your elders go on and on about long-dead friends and relations might be anathema to some, Mann concisely and incisively conveys the ordinary and extraordinary life circumstances of these amazing women." "...Most memorably, Chuck Smith's Goodman Theatre production is full of tales of gamesmanship and outright social defiance the Delany sisters engage in while having to navigate the demands placed on women of color in their white-dominated professions (Sadie was a teacher and Bessie a dentist)." "...Now gracing Goodman Theatre through June 10, Chuck Smith's delightful revival couldn't be more intimate, despite the vast Albert stage. But then so is its source: New York Times reporter Amy Hill Hearth's 1991 book, the best seller that inspired Mann to turn the Delanys into the loveliest hostesses ever." "...From the very first moment, the words of this engaging duo capture your imagination and your heart. You forget the amazing acting talent, superior writing and engrossing stagecraft and believe you are in the presence of 103 year-old Sadie and 101 year-old Bessie. You follow their dedicated, committed lives through a century, beginning with Reconstruction after the Civil War, and progressing through the abomination of Jim Crow laws. You go with them as they move to New York after college in the South, take part in the blossoming of Black Culture during the Harlem Renaissance. You enter with them into their participation in the civil right's and women's right's movements, and smile indulgently as they explain how they stayed virgin "spinsters" after "watching the roosters worrying the hens"." "...Amy Hill Hearth wrote the critically acclaimed memoir of this historically accurate, nonfiction account of the trials and tribulations of the 'good nature' Delany sisters.' However, The Delany sisters' lives were brought to life on stage by the unconquerable Director Chuck Smith who showcased the women with wit and wisdom. This family drama played out for two hours with over 100 years of oral history that will leave you enriched with knowledge of one family who happens to be colored in this country." "...The story is amazing and spellbinding and the performances by these two powerful ( and loveable) actresses is one that should not be missed. As I said the performance is the shortest two hours of theater I have been an audience member of and I would have loved to hear a few more stories as well as see the meal that they worked on finished." "...There is an almost musical interplay between Joyce and Thomas that ideally captures the sisters' relationship, and all the feistiness, humor and determined individuality they brought to it. And they make it easy for you to cheer the Delanys, who proudly declare that they never let prejudice stop them from doing what they wanted to do in their lives." "...This delightful adaptation of "one of the Best Books of 1994" is a welcome addition to the Spring season of Chicago theatre. It's an uplifting, thoughtful, humane and empathetic play-just the kind of entertainment we need now in this country. Often, Emily Mann's inspiring adaptation of this oral history is as humorous as it is heartbreaking. Brought to life by veteran director Chuck Smith, and featuring two talented and affable actors, there's much to be appreciated and gleaned from this heartfelt piece. It's the perfect introduction for middle and high school students to hear about history from individuals who actually experienced it." 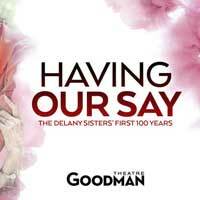 "...�Having Our Say� is an intimate play but Goodman has chosen it for the larger Albert Theatre rather than the smaller Owen Theatre. But the two performers fill up stage effortlessly, orchestrated by Chuck Smith�s unobtrusive but sure-handed directing. The apparently spontaneous talk flows naturally, creating a verbal mosaic of dozens of characters who were prominent in the lives of the sisters. The physical production also receives much help from Linda Buchanan�s heavily furnished period d�cor. The production makes deft use of the Goodman turntable stage, rotating in front of the audience to take the viewers from room to room." "...Having Our Say is great oral history, but it's not always great theater. Two hours of two people talking to us without much action can be a long evening. The play would benefit by being cut to 80 or 90 minutes. Some childhood details could be trimmed and details added to the important events of their later years." "...Adapted by Mann from the book written by the Delaney sisters with Amy Hill Hearth, the play offers terrific insight into bits of the 20th century from a viewpoint seldom heard or viewed. I'm glad the Delaney sisters are having their say." "...My mother always said that there is a lot we can learn from our elders, and an evening spent with �the Delany Sisters,� a pair of centenarians whose life story is the subject of Having Our Say: The Delany Sisters� First 100 Years, now at the Goodman Theatre, certainly illustrates the point. Ella Joyce and Marie Thomas play Bessie and Sadie Delany, respectively, two sisters with extended family memories all the way back to 1812 who told of their century as black women in America in interviews with Amy Hill Hearth in the early 90s for a book that was transformed into a play by Emily Mann shortly thereafter." "...In the opening moments of Emily Mann's Having Our Say: The Delany Sisters' First 100 Years, Bessie and Sadie Delany gather us up in the living room of the Mount Vernon, New York home they have lived in since 1957 and begin a conversation that takes us on the fantastic journey of their lives together. There are powerful resonant truths, sadness, and abundant humor in director Chuck Smith's inspiring production, now playing at the Goodman Theatre. The consummate performances by Ella Joyce and Marie Thomas tell a sweeping narrative about racial inequality in America and overcoming adversity with grace and dignity." "...Joyce and Thomas portray the sisters with grace and charm, creating a truly compelling and thought-provoking account of history. The play itself may just be two women sharing their life story, but Smith's production is captivating, with a pacing and comedic element that keeps the audience hooked on every development."